The Celestron 127 EQ PowerSeeker is a Newtonian reflector telescope. This means that it uses mirrors to gather light and reflect the image for viewing, in contrast to Refracting and Catadioptric telescopes which use lenses (as well as mirrors in the case of catadioptric). Mirrors can be produced at a lower cost than lenses and so consequently a reflector telescope can offer more value when it comes to cost per inch of aperture. In simple terms we can say that the larger the aperture, the more precise and clear your view will be. Of course, there is a lot more to it than that! The Celestron 127 EQ has a 127mm aperture (5 inches). This is a very good size for a starter to intermediate scope and you will be able to view the moon in superb detail as well as brighter planets, nebulas and star clusters. No matter how large the aperture is, your telescope needs top quality optical elements for you to be able to enjoy your time with it. 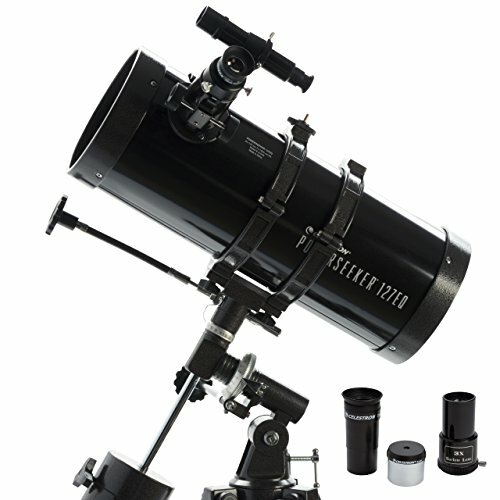 The optical components in the Celestron 127 EQ PowerSeeker are all made from glass, fully coated with high-transmission (reflective) aluminum to give even more refinement and definition. It is a sign of true quality and excellent design.